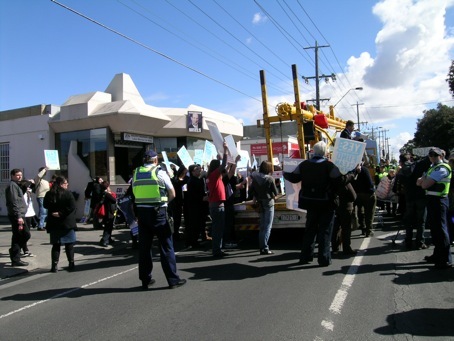 Coburg rocked to the chants of competing climate protests recently, as Climate Action Moreland members joined about fifty Moreland locals at one of the oddest rallies we have so far attended. 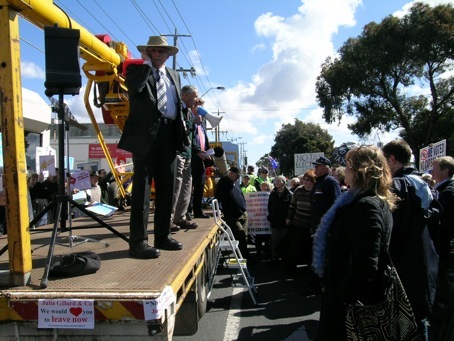 We were there to counter a ‘Convoy of No Confidence’ anti-carbon tax rally held on 9 September at local MP Kelvin Thomson’s office, which was organised by The Consumers and Taxpayers Association. This is a group that did not exist until just weeks prior to the Canberra “no carbon tax” rally in March. 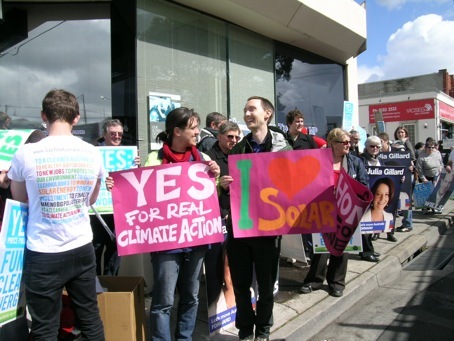 The association’s website is http://www.nocarbontaxrally.com. Need we say more? We arrived outside Kelvin’s office, where placards and t-shirts were distributed by Kelvin’s staffers. Fortunately, CAM had come prepared with our own posters. 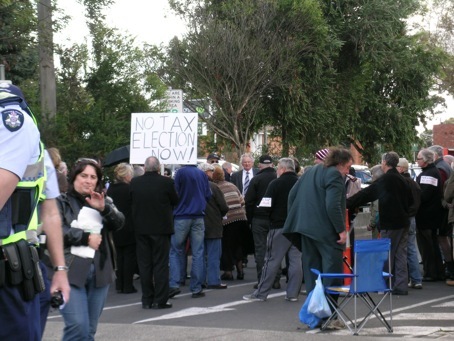 The anti-carbon tax mob of about fifty people arrived en masse, and boy were they mad! For over an hour the two groups faced off, divided by a large flatbed truck that accompanied the convoy. An early cacophony of chants from both groups quickly settled into “No Carbon Tax!” versus “Yes Carbon Tax!”. Then it got really odd, as the two chants quickly came into perfect synch, reaching Dr Seuss levels of absurdity. The CAM people squirmed a little at the pro-carbon tax chants, knowing the diverse views that CAM members have on Labor’s carbon tax policy. Ellen suggested we chant “Yes carbon tax! But we’re not really sure! And not all of us!” Anyway, we were there with our pink signs to broadly support action on climate change regardless of party politics. Within a few minutes they surrendered and ushered the group across to the far side of Harding St, where they took turns yelling into their loudspeaker. 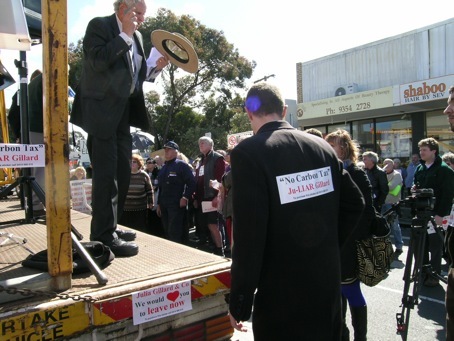 The Coburg anti-carbon tax rally was targeting Kelvin Thomson in response to his reference to “The Convoy of Incontinence”. While Kelvin is no doubt a man of principle and good intentions, in this instance he unfortunately let his love of a good joke get in the way of sensitivity to medical conditions. Several upset people at the rally loudly called for an apology from Kelvin, who was advised by police against making any public statements to avoid an ugly confrontation. Given the level of vitriol displayed by many convoy members, this was a wise move on Kelvin’s part. We were screamed at incoherently a number of times by people who broke away from the group across the road to have a go at us. In response, we mostly just smiled and chanted to drown them out. And we were yelled at multiple times to “go get a job”, despite our assurances that we had taken time out of our jobs to be there, and despite the number of convoy members who were themselves well under retirement age. A few amongst our group cheekily called out for the convoy members to “go have a bex and a lie down”. And indeed, this seemed like sound advice, given the screeching emitting from the loudspeaker across the road from various people, who all sounded on the verge of a complete breakdown. They also needed some punctuation lessons. CAM member Ellen valiantly took up the challenge to speak briefly with the convoy truck driver, who was concerned about how the carbon tax would affect his trucking business. They exchanged contact details to set up a meeting. Here, at least, was one person willing to discuss the issues and listen to some alternative viewpoints. Unfortunately, most convoy members seemed to be getting their information from the likes of radio shock jocks, given some of the claims about climate change that were shrieked at us. 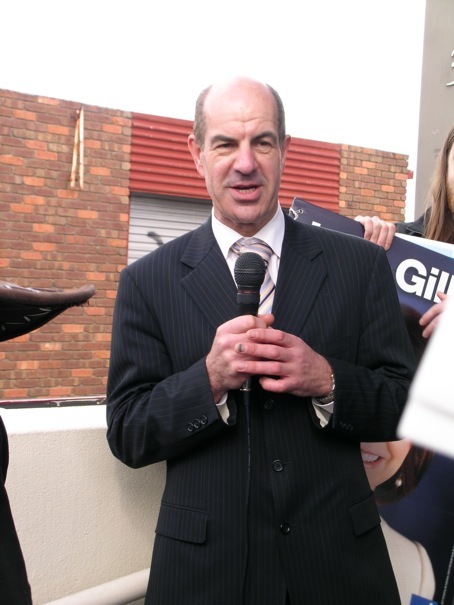 It was Sydney radio shock jock and pompus ranter Allan Jones who was a driving force behind the Canberra anti-carbon tax rallies. He also coined the super clever term ‘Ju-liar’, which was printed on stickers plastered all over the rally. "Ju-liar" - really? Is this the level of discourse we have here? As the afternoon dragged on, and people from our group had mostly drifted off to work and study and family, Kelvin finally took to the microphone. He delivered the world’s quietest amplified speech to his remaining supporters, so as to avoid rousing the convoy remnants. They stayed huddled around their loudspeaker. Meanwhile, the homeless-looking man in their midst, who was somehow equipped with a folding chair and beer stubbies, yet again rummaged through the Harding St wheelie bins. All in all, it made for a very odd, somewhat amusing, but definitely disturbing few hours. It’s shocking to be screamed at in fury by people who could easily be your father, your uncle, your sister. Especially in the cause of trying to, you know, avert the collective suicide of humanity. While each person involved in the anti-carbon tax rally no doubt has their own story, their own concerns and worries and reasons for being there, they are playing a part in a much bigger and very dangerous game. Perhaps many of them intuit this, deep in the depths of their cognitive dissonance. But whatever their private reasons for attending this rally, whatever drives their intense anger, it seems clear that most of the convoy members don’t see climate change as a serious or even a real problem. 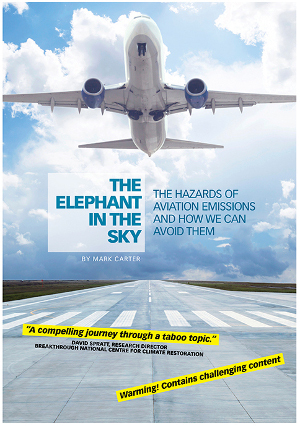 We have CAM members who are against the carbon tax for various reasons, but of course they promote strong action on climate change by other means. And they wouldn’t dream of joining the convoy, since it is so counterproductive and has been orchestrated by climate deniers and vested interests. 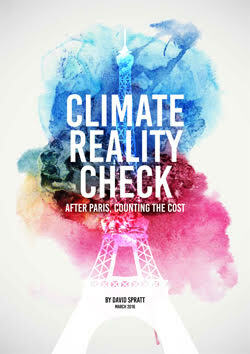 People such as Alan Jones and Tony ‘people’s revolt’ Abbott, who reduce the issue of climate change to party politics and prey on scientific illiteracy and those with private grievances to spare. 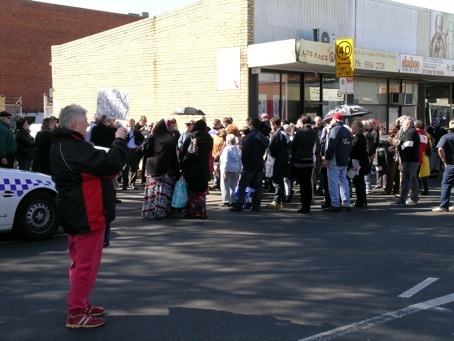 In this, those people at the Coburg anti-carbon tax rally ARE victims, just not in the way they think. They have been lied to and manipulated and duped. And it’s not us they should be yelling at.